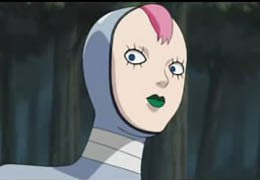 Nurari is a shinobi who appears in the second Naruto Shippuden filler arc. Despite his slender and somewhat female appearance, he is male. After the selection battle Guren and Kabuto held in Orochimaru's hideout, Nurari becomes Guren's subordinate together with Kiho, Kigiri, Gozu and Rinji. The five of them then rest in a strange kind of ruined, old house while Guren leaves. Later when Guren detects the presence of Team 8, Nurari is sent with his team to dispose of them. He ends up fighting Hinata, but thanks to his unique ability to shift his body, he is able to render Hinata's Gentle Fist virtually useless. In the end, he retreats with his team after they detect Shino's insects. Later, he and the rest of his team are ordered to destroy Team 8 and Team Yamato while Guren goes on ahead with Yukimaru and Kabuto. Like Orochimaru, Nurari seems to have gone through physical modifications that allows his body to bend and stretch in exeedingly unusual manners. With this ability, he can fight at any range or shift his body's structure to avoid having internal organs or chakra points damaged. His stretching power also allows him to flatten his entire body, protecting him from being crushed.